Click on the video and you’ll see a whole fleet of not-so-little ducklings in what looks like a feeding frenzy at Albany’s Talking Water Gardens. Why show this? In case you need something totally mundane and unexciting to watch. In fact, if you’re looking for a little relaxation, this is a pretty good time to go for a hike, or a bike ride as I did Thursday afternoon, through this constructed system of ponds, weirs and waterfalls. 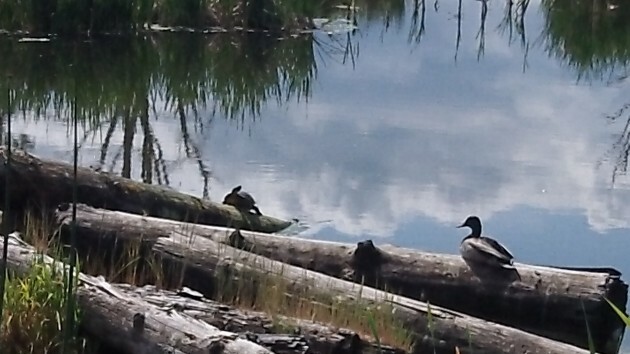 Besides various mother ducks and their offspring, you see all kinds of other birds as well as other wildlife. Turtles are one attraction, and so are frogs. Or maybe they are toads. Hard to tell since only their eyes break the surface as they wait, presumably, for some bug to come within reach. A duck and a turtle take in some sunshine Thursday afternoon. This is one expenditure of my “coveted taxes” I harp about that I’m 100% behind! Having seen the area & cut firewood from cull logs years ago I knew what a sore it was. Quite a project that our future generations will thank our foresight. Just wish they would put a railing around those water intakes that are so close to the paths. Thank you! This is a great project. What would make it even better would be to remove any non-native growth and put hemp in there to clean the area up. Let’s make that happen!